The purpose of this blog is to explore, discuss, comment, contribute, and otherwise focus on the subjects and ideas addressed in The 8 Essential Skills for Supervisors & Managers written by Paul Knudstrup and published in 2010. This process has been an interesting learning experience for all of us at Midwest Consulting Group. The creation of The 8 Essential Skills has been very much of a team effort. If it takes a village to raise a child it takes a team to make a work of this magnitude stand up on its own legs. Like most books, there’s a story behind it. This blog will be focused on two concepts; the creation of The 8 Essential Skills – how it went from an idea to finally, now, a finished product, and the actual content of the book. You’ll find my thoughts, ramblings, gripes, and satisfactions under the tab marked The Process. 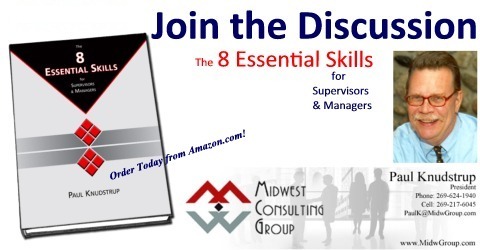 The ideas expressed in the book – the content – will be the main topic of this blog, so you’ll find more and more information on The 8 Essential Skills in various places as we go along. Now that the book is out there we’ll also host discussion, invite comments, and see what kind of ideas show up. We’re always looking for neat-to-hang-out-with people; are you one?